Research in Motion rattled off a slew of product updates at its Blackberry World conference Monday, including new Bold smartphones, the Blackberry 7 OS, and a couple of key apps for the Blackberry Playbook tablet. These aren't game-changing announcements. I don't see anything among RIM's press releases that will catapult Blackberry over the iPhone and Android in the smartphone and tablet wars, but they should help RIM hang on to some relevance as it ceases to dominate the smartphone market. 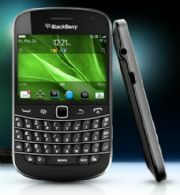 RIM's Blackberry 7 OS doesn't merge with QNX, the operating system that runs on the Blackberry tablet. Instead, Blackberry 7 OS adds some basic improvements like voice-activated search and a faster, smoother Web browser with HTML 5 support. Engadget reports that only new phones will get Blackberry 7 OS, leaving the relatively new Blackberry Torch out in the cold. The first smartphones to run Blackberry 7 OS will be the Bold 9900 and 9930. Due out this summer, the phones have a physical keyboard on the bottom and a 2.8-inch touchscreen on top. A 5-megapixel camera in back supports 720p video capture, and near-field communications support is built-in for the inevitable smart tag and mobile payment craze. Other specs include a 1.2 GHz processor and 8 GB of built-in storage. The GSM/UTMS Blackberry Bold 9900 supports the "4G" that AT&T and T-Mobile are currently touting, while the Bold 9300, a CDMA world phone, is 3G-only. The Blackberry Playbook will soon be getting a couple apps that should've been available at launch. Video Chat, which will be delivered in an over-the-air update on May 3, lets Playbook owners talk to one another using the tablet's front- and rear-facing cameras. Still no word on cross-platform video chat apps, such as Fring and Skype. A Facebook app for Blackberry Playbook will be available through App World some time this month, with the requisite news feeds, wall posts, photos, videos and chat. Here's a nice feature for IT pros who worry about the infiltration of consumer tech in the enterprise: Blackberry Balance is a service that tries to separate business and personal uses on Blackberry smartphones. When activated, it prevents users from copying, sending or using business data in personal applications, and tells the user when an action is against IT policy. If the user leaves the company, Balance lets the administrator remotely wipe all business information while leaving personal information and apps intact. Perhaps the most surprising news out of Blackberry World was the announcement of a Web-based management tool for IT administrators that supports Android and iPhone in addition to Blackberry phones. This allows administrators to activate, wipe, lock, or otherwise manage phones over the air, while also accessing features that are exclusive to Blackberry, such as the aforementioned Blackberry Balance. Implicit in the announcement is an admission that Blackberry no longer dominates the enterprise, and that giving administrators a way to manage iPhones and Androids is a must.